My favorite liberation story: I heard an athlete on a girl's high school basketball team in Nebraska say, in a response to being called a "Huskette" (the boy athletes are "Huskies"): "I am not an ette! I never have been and never will be an ette!" It works really well because ette has a very clear meaning here, 'girl athlete' and pretty clearly inferior to males. And of all team names, the Huskies don't lend themselves to a women's team. Plus a young woman who's serious about her round ball is truly not an ette, not in a day when she could be thinking about college scholarships and turning pro. But it's even cooler for the name — degrammaticalization is awkward as a term, liberation is far better. Reminds me of the old slogan: Free the bound morpheme! 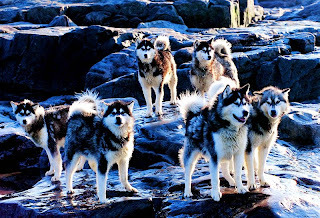 Image of (real) huskies from here. Mr. V, you've been reading my mind lately. I had been wanting to write about ish, but I didn't have that much to say about it except that I noticed it being used ALL the time as an independent lexical item. Turns out that the online OED actually recognizes it as such, dating back to the 80s! I hear "esque" sometimes used similarly. Oh, glad to know that my mind is doing SOMETHING these days. Wasn't there a conference paper last year or so about degrammaticalization of ish? I didn't give a ref because I couldn't find one offhand, but I'm pretty sure somebody has presented or posted on this topic. Maybe I just heard somebody was working on the topic. But I didn't realize it was so old either. Bingo! I didn't actually hear the paper, but remember reading the abstract. There are quite a number of morphemes that have become independent words -- in addition to the examples mentioned here, you can see the pros and cons of something, be pro this or anti that, despise isms or be very meta about the whole thing. I wonder, though, how serious a threat to unidirectionality these cases are. First, they are all derivational morphemes, so the question is how ‘grammatical’ they are to start out with. Second, they seem to be very conscious creations, almost word-play-like -- not at all like true grammaticalization processes, that take place over many generations, mostly unnoticed by speakers. Third, these cases are hardly ‘popping up everywhere’ -- there are less than a dozen cases, most, if not all of them, highly restricted in genre/register. Their rareness as compared to the ubiquity of well-behaved cases of grammaticalization really just underlines how strong unidirectionality actually is. I agree with the 'conscious creation' angle -- like I said, they do seem playful somehow. And surely grammaticalization is the more common route. But it IS a challenge for people who want absolute unidirectionality and I've heard whole papers trying to get rid of these creatures. The counts vary on just how many (Haspelmath's classic paper has a number like the one you give, I believe), and if we have a dozen derivational affixes degrammaticalizing today in American English, I'm not sure that's trivial. How many things are grammaticalizing INTO affixes now? I'd be more comfortable if we had some sense of what the full set of examples is. Maybe somebody out there has compiled a good one, but I don't think I've seen it. The 'conscious creation' aspect of these examples goes away once children are involved. The first time a kid hears 'meta' in that type of usage is not really going to be any different from when they hear 'protagonist', 'polyhedron', 'rhombus' or any other new word they are exposed to. They are just completely indiscriminate word sponges...gotta love em. This also begs the question for adults too. Not all adults have the super high powered vocabulary that all readers of the mighty Mr. Verb blog do. Although I admit it will be much rarer, I don't think it is completely impossible for some adults to have their first experience (that sounds kind of dirty, sorry Mr. V) with 'meta' used in the hip colloquial way that we're talking about. Do all of us know what an 'aiglet' is? How about a 'verglun'? Learning new words is something we stay pretty good at throughout our lifetimes and we have to remember that very few if any (maybe some historical liguists...) have a running etymology of every word they hear available to them. I'd been meaning to write about 'ish' for a while, in reaction to a reader's query, and this post got me going there. Here's the link, if you're interested. Although many of ish's current uses are playful, ish's status as an independent word wasn't created in a burst of playfulness -- although "ette" may have been. Ish was used as a clitic, attached to phrases (as in "pale yellowish") well before the earliest citation I've seen for ish used as an independent word. It's a case of gradual evolution. Since LSA, I've been researching ish's earlier history. As it turns out, esque and ish are descendents of the same morpheme, originally, so I've also been collecting data on esque. I'd really like to hear about your observations, pc. I've seen esque used as a qualifier the way ish is, like Stephen Colbert's "It's been widely reported, which makes it fact-esque," but esque doesn't seem to be as far along on that path. Oh, so the historical path is clearly gradual? That makes it much more like grammaticaliztion, of course. I may do a follow up post on this, mostly asking questions. Back in my junior high school (late 1970s, suburban New England), the student body adopted "n't" as a standalone word. It served the same function as the "not!" which became popular nationally a few years later. Oh, that's brilliant! If memory serves, Zwicky & Pullum (in whatever order) argued in their classic piece in Language that n't has become inflection in English. So, that would be a move from inflection to free word. Of course, it sounds like you were keeping the reduced pronunciation, violating the phonotactics of English. Even cooler. What a great article! I'm a paper for my linguistics class and my teacher and I have been unable to find anything written about -ish's transformation from a suffix too a grammatical word. Thanks for the source btw! There's a growing lit on degrammaticalization generally, some since this post was originally done.